Friends! Loved Ones! Enemies! Join us! On December 8th, we will be officially lighting our magnificent (non-denominational) holiday tree! Enjoy the spectacle of electric lights, meticulous decorations, and a very special tree-topper while partaking of complimentary warm beverages. Bring us a toy donation for Toys for Tots on 12/8 and receive a very special holiday gift from Vault of Midnight, while supplies last. Most needed are toys for kids aged 9-12 such as sporting equipment, books, backpacks, cosmetics, purses, watch/wallet gift sets, bath gift sets, board games, radio control cars, hand-held electronics, skateboards, helmets, curling irons, hair straighteners, and hair dryers. Toy donations will be accepted at ALL Vault of Midnight locations and will be distributed to local kids in your county in need of some holiday cheer! Plus, limited edition Vault of Midnight ‘holiday sweaters’ are available now! Sip your cocoa in style while reminding your friends and loved ones where to pick up your holiday gift this year. Order this online-exclusive today! Looking for an extra-special gift? Pick up a signed copy of these brand new graphic novels! Revisiting one of the most formative events in Andrew Rostan’s life, FORM OF A QUESTION tells the true story of his journey at age twenty-two to become a contestant on JEOPARDY!, the very show he associates with the happiest moments in his life. But even with an uncanny ability to remember the smallest details and his almost unparalleled depth of knowledge, there’s one thing Rostan hasn’t learned yet – life is like his favorite game show. In fact, all the answers are staring you in the face if only you ask the right questions. 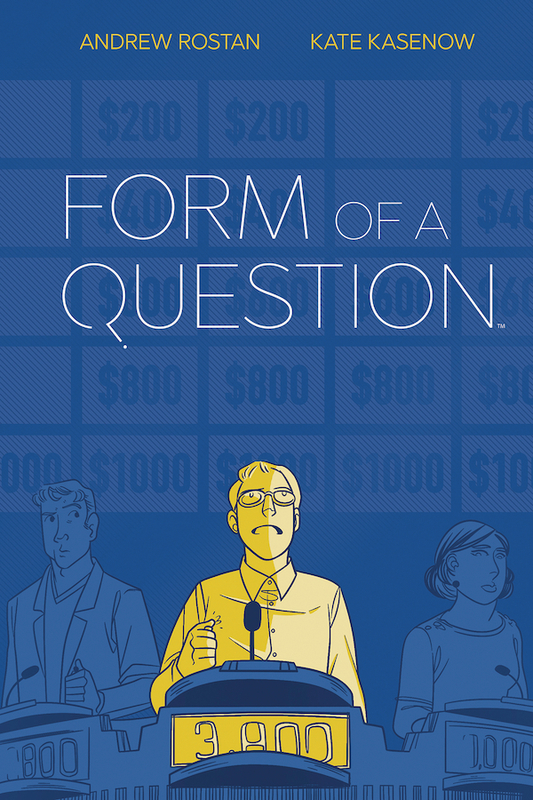 Andrew will be signing copies of FORM OF A QUESTION from 1:30-4p at Vault of Midnight Ann Arbor. Life comes at you fast, but dodgeballs come way faster! Tomás is a teenage misfit, but when he joins the Jazz Pandas dodgeball team, he finds a place where he can really belong, and a family of oddballs and outcasts who are willing to do whatever it takes to win the summer regional dodgeball championships. From creator Josh Trujillo (Adventure Time: Brain Robbers) and artist Cara McGee (Over the Garden Wall), comes a comic that packs punch and a whole lot of heart! Cara will be signing copies of DODGE CITY from 12-4p at Vault of Midnight Grand Rapids as well as accepting on-the-spot commissions for custom holiday greeting cards! Free gift wrapping will be available throughout the evening. It's our very favorite time of year, and we can't wait to spend it with you!